Where does Washington rank on this Top Tech Towns list? Information technology trade and certification association CompTIA's Tech Town USA report ranks the Washington region just outside its Top 10, though median IT pay in the Washington region is considerably more than many of the top 10. WASHINGTON — Information technology trade and certification association CompTIA’s Tech Town USA report ranks the Washington region just outside its Top 10, though median IT pay in the Washington region is considerably more than many of the top 10. The report also factors in the cost of living in each city, pulling down the D.C.-area ranking. 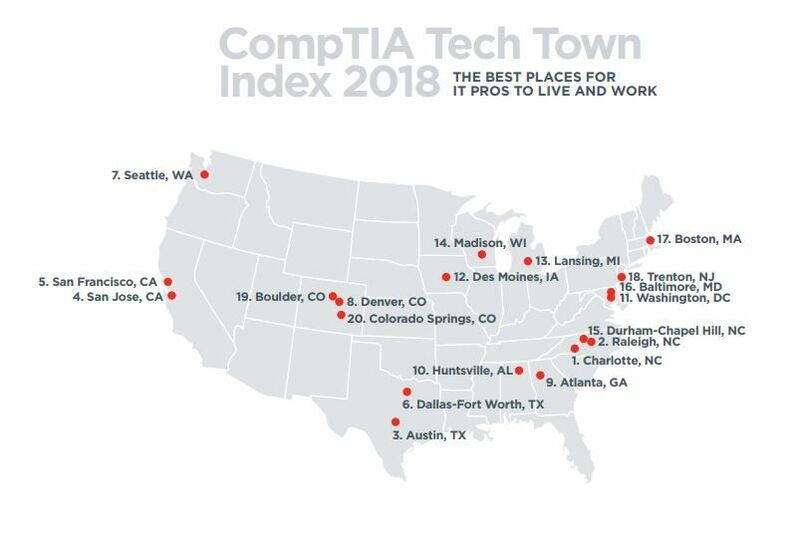 To determine its “Top 20 Tech Towns,” CompTIA compiled a list of markets where demand for tech workers is the greatest, then ranked them based on cost of living, number of open IT position, and projected job growth over the next five years. The Washington region ranks No. 11 on this list, with a median salary for IT professionals of $103,397. That is $11.13 more per hour than the national average. The cost of living in the Washington region is 18.6 percent higher than the national average. There were 170,187 IT job postings in the Washington area between August 2017 and July 2018, more than any other city on the list. The D.C.-area is fertile ground for technology professionals in part because of government contractors. CompTIA says top IT employers here include consulting firms like Booz Allen Hamilton, aerospace and defense company General Dynamics and government technology solutions company ManTech. The area is also a growing market for tech startups. In 2016, D.C.-area entrepreneurs raised over $2.7 billion in venture capital funding. The D.C.-area also ranks No. 1 for women in tech on a Forbes list, with one of the most diverse tech-related workforces and one of the smallest gaps in gender pay. The region also has a higher than average proportion of women in computer and match-related roles. North Carolina emerges as a top destination for IT professionals based on CompTIA criteria. Charlotte ranks No. 1 for job opportunity and cost of living. Raleigh is just behind at No. 2. Durham-Chapel Hill ranks No. 15.